To stake or not to stake your tree? It is important to know when to stake a tree or not. Wind in trees does more than just rustle leaves. The gentle breezes, prevailing winds and cyclonic occurrences that arise from daily and seasonal changes in solar heating all affect the growth and very survival of trees. Strong winds cause trees to sway, pulling and stretching their roots. The movement disrupts root-soil contact, decreasing water absorption and increasing the severity of water stress in trees. The durability of leaves tossed about by the wind and exposed to other factors of the environment is amazing. At the same time, it is not surprising that almost all trees survive an entire growing season completely unscathed. In very still air during warm weather a tree is enclosed in a super-heated envelope of boundary layer air next to its surface that resists the loss of heat. Wind reduces or removes the boundary layer, increasing the rate of cooling just as a breeze has a cooling effect on us. In cold weather, conductive heat loss is even greater. Once a leaf or twig is at air temperature, wind will tend to maintain this balance by both removing and adding heat. Wind will not increase cold injury in trees if they can tolerate the air temperature. In fact, wind can be a benefit and will keep exposed tree parts at air temperature when it is needed. However, in areas where the ground freezes in winter, wind can cause injury by increasing moisture loss and causing winter burn by excessively drying the trees. Gentle breezes and prevailing winds also influence trees in subtle ways. The rate of heat loss from leaf and twig surfaces and even the growth of tree trunks can be influenced by mild winds. Moderate winds have distinct effects in sculpting the very shape of trees. A tree stem must be free to move or flex for proper development. The diameter of the lower trunk is greater in free-swaying trees than in those prevented from moving. Free-swaying trees also are shorter than those held rigidly or protected. The regulatory control of growth distribution in a tree is complex and not completely understood. When branches are continually bent in one direction by prevailing winds, they become “wind trained” and hold their position permanently. Some branches grow completely around the trunk from the windward to the leeward side. New growth is so desiccated on the side facing the wind that it is killed before it can develop. To avoid abnormal development, staking newly planted trees should not be done unless absolutely essential. On windy sites with heavy soils, it may be necessary to stabilize the tree with stakes for a few months to prevent young roots from being damaged as they grow into the soil. Once sufficient root growth has anchored a newly planted tree the stakes can be removed. Staking and severely pruning containerized trees in the nursery tend to produce spindly trees that often are unstable when planted in the ground later. Better quality trees can be grown by eliminating staking in the nursery, leaving lateral branches on the stem, and spacing containers so the tree tops are free to move in the wind. 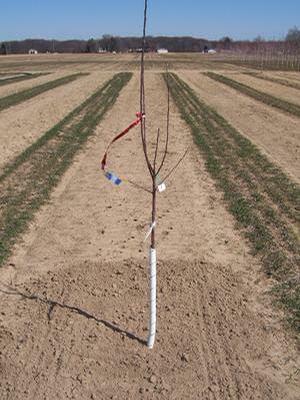 Our trees, whether they are stone fruit, bare-root or containerized are very stable. However, you still need to be aware of the soil conditions you are planting in. As it plays a hand in how wind will later affect your trees. Excessive compaction, trenching, removal or filling of soil around the base of trees can damage root systems. This would make your trees susceptible to “wind-throw” which is the uprooting of trees due to heavy or cyclonic winds. If heavy rains precede these winds and soften the soil around the base of the trees, wind-throw is more likely to occur.